Compo Beach Palm Tree Returns! Last June, Westporters thrilled to the sudden appearance of a palm tree at — of all places — Compo Beach. It was all a big — and very cool — mystery. The next day, “06880” uncovered the story. 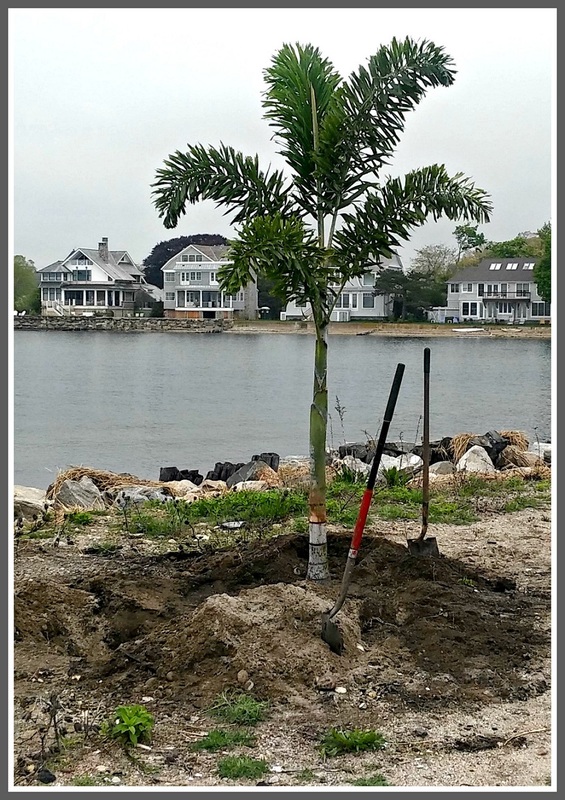 Butch Izzo — whose Izzo’s Landscaping has a contract to plant trees around Westport — donated the palm. It replaced a different species that had died on South Beach, between the kayak launch and Ned Dimes Marina. Parks and Recreation was not amused. But the public was. Quickly, Parks and Rec embraced — metaphorically, anyway — the unusual tree. It remained there, loved and admired and frequently photographed, until it was removed for the winter. Or at least, a different palm tree is. Butch Izzo and his crew planted it this morning. It’s there — presumably — for the season. Last year, the palm tree was fun. This entry was posted in Beach, Environment, Local business, Organizations, People and tagged Butch Izzo, Compo Beach palm tree, Izzo's Landscaping, Westport Parks and Recreation Commission. Bookmark the permalink. I spotted this little gem this afternoon…took my own not-so-good photos. Thanks again to Butch Izzo…as suggested it may be a tradition and one that makes me smile. One of the many reasons I love this town! Woo Hoo! I’ll have to make a new “Palm Beach” sign. Thank you Butch! Love the tree!!! The Izzos, the Gilberties, the Calises…..And so many more are the heart of what makes Westport special and always have been. Thank You one and all. Hope this experiment fares better than last year’s disposable Palm. Nancy, what are you talking about? Palm trees don’t survive winters here. It was removed as it was planned to. Then why post “RIP Palm Tree” last fall, and clearly admit it’s a different tree today? Good luck to this one. Nancy, please 1) get a sense of humor; 2) stop commenting on things you have no knowledge about, and 3) honor your previous pledge to leave the “06880” comments section. It’s the least you can do for US-Canada relations. All trees eventually die. If they’re lucky, they get turned into lumber, or paper, or furniture, or charcoal. Even happens in BC. Thank you Tom…..I love it! Nancy, somehow this doesn’t seem to be an event which merits a snarky comment. Refer to how happy all the previous commenters are. I’m not inclined to think that a man like Butch who must work all day with trees and other growing things would just carelessly discard the previous palm – perhaps it is last year’s tree lovingly cared for all winter and returned. Bonnie, I think it’s a different kind of palm. But it sure is lots of fun to have a palm tree at Compo. love – Love – LOVE IT !!!! Yay for everyone making their voices heard to bring it back. Ditto Yay! Yay Izzo, thank you! this year it makes me smile more. Kudos to Butch! The Palm Tree has far more pizazz than that tree that used to grow in Brooklyn. Thanks Butch…..everyone in this household loves the Palm Tree! Awww … it’s so cute! Be fun to plant a whole bunch more, LOL! next year we should have some type of ceremony to celebrate its return! Thanks Butch it makes me smile and yes it’s fun in Westport. Can’t wait for my photo next to it. This is so fun- I hope the tradition continues for years to come. For me personally, I find it ironic because last night we returned home from Puerto Rico, where my husband was born and where he celebrated an absolutely triumphant return there with an extraordinary concert and accolades celebrating his Golden Anniversary of International Acclaim. But now I see that our “Compo Palm” brings it all together for me this morning. To Butch — thanks so much for making so many people smile. To Dan — can’t you just block Nancy? Bobbie, do you agree that the purpose of a forum is to share opinions, information, ideas, or to bow to the emperor? I’m happy that this tree makes you happy. I simply think it is a waste. This is one person’s “negative drivel” (I’ve been told). Bobbie…Ms. Hunter imbues negativity in most if not all of her comments. I ignore her comments. Dan has shown enormous patience with her comments. The tree is whimsical happiness. My wife and I were lucky to see Butch’s guys planting the new tree which grew first in Florida. We were happy that there would be another period of fun caused by a seeming “Huh” moment. Two young ladies walking by were also gleeful as we four “cheered” the event. Let’s try optimism and glee before we sink to Ms. Hunter’s incessant pessimism and snarky darkness. Mr. Leyden, I am happy that you are happy to have this tree, and hope it thrives in this zone, this season. As far as negativity and pessimism, look only to the bulk of comments here on too many posts, comments written to and from present Westporters, themselves. Somehow, opinions submitted by “foreign” Westporters are troublesome. Sometimes ideas from elsewhere are helpful, sometimes not. Whatever, please know that my ears and eyes are always open, especially when our shared environment is concerned (3000 miles isn’t really that far away). I have no apologies for speaking my mind, though regrets for my naïveté regarding the forums/blog mindset. Westport has changed dramatically, but is irreplaceable to those who had the luxury of living our formative years there. Best wishes in solving Westport issues in future. I think, Ms. Wilson, that the issue is not that your opinion isn’t welcomed … it’s that it didn’t appear to serve a purpose. Amidst a dozen happy voices from people who currently live here and directly benefit from the silly joyfulness and lovely aesthetics of a palm tree in New England, you – who now live far away – chose to concern yourself with a potential dark side. That opinion won’t make any difference in what has already taken place, other than to bum us all out. You might wish to contact the Izzo Bros. and see if you can’t arrange to have the palm tree transplanted near you in Canada at the end of summer. It’s a lovely idea, really, because it would bring a piece of Westport to you each year. What do you think? I JUST LOVE,LOVE, THE PALM TREE! If we don’t get the storm this afternoon, I have to go see it and walk the beach. It makes for such conversation for my out of town friends! Thank you to the Izzo family for all you all do. Amazing!